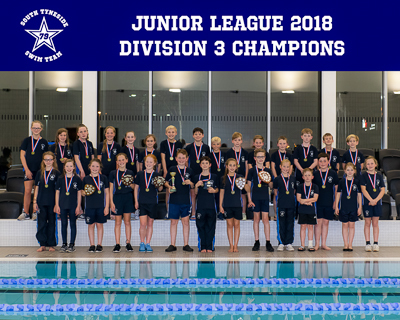 The Junior League 2018 Division 3 Champions Squad photograph is now available to order. If you wish to order this photograph, it is available at a size of 10" x 8" for £3.50. Please place your order at the Learn to Swim desk or order via Karen Kirsop at squad training sessions. Orders placed will be processed in time for delivery at the next Swimmer of the Month. Just want to say a huge well done to all swimmers who swam in the Junior League Final you were all amazing, fantastic, brilliant, whether you swam 1 event or 8 events we couldn't have done it without you!! Click on more for full message. 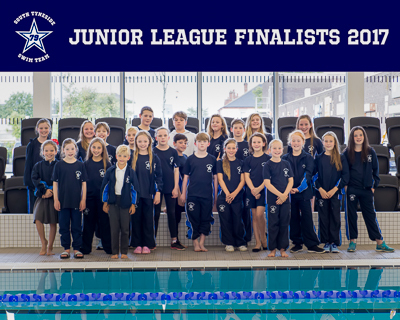 The Junior League Finalists Squad photograph is now available to order. If you wish to order this photograph, it is available at a size of 10" x 8" for £3.50. Please place your order at the Learn to Swim desk or order via Karen Kirsop at squad training sessions. Orders placed will be processed in time for delivery at the next Swimmer of the Month. Arrangements for those signed up for the Junior League Team Bowling Party are to meet at the Dunes at 2.45pm on Saturday 28th June. 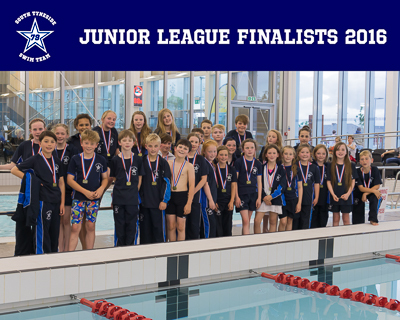 Unfortunately we have missed out on the 2014 Junior League Final by 1 point! A massive well done is still in order to all who were part of the Team and we look forward to the challenge of Division One again next year. Will all members of the 2012 Junior League Squad please add their name and t-shirt size to the list posted on the noticeboard at Hebburn Pool as soon as possible. The order will be placed with our supplier following next Wednesday's (23rd May) training session. We are taking part in the annual Durham City ASC Friendly Gala held at Freemans Quay on 22nd January. Details for the squad have been posted on the noticeboard at Hebburn Pool. All swimmers should meet at the Freemans Quay Pool, Durham at 8.00am and we should be finished no later than 11.00am. Club kit is to be worn. The group photograph of the 2011 Junior League Squad is displayed on the noticeboard at Hebburn Pool and available to order.